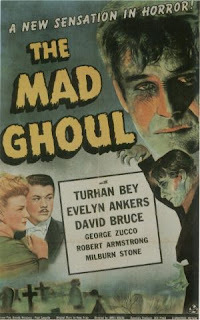 ‘A New Sensation in Horror’ proclaimed the poster for 1943’s The Mad Ghoul. A bold claim indeed, unless one counts frustration at the lack of any originality as a fresh feeling. 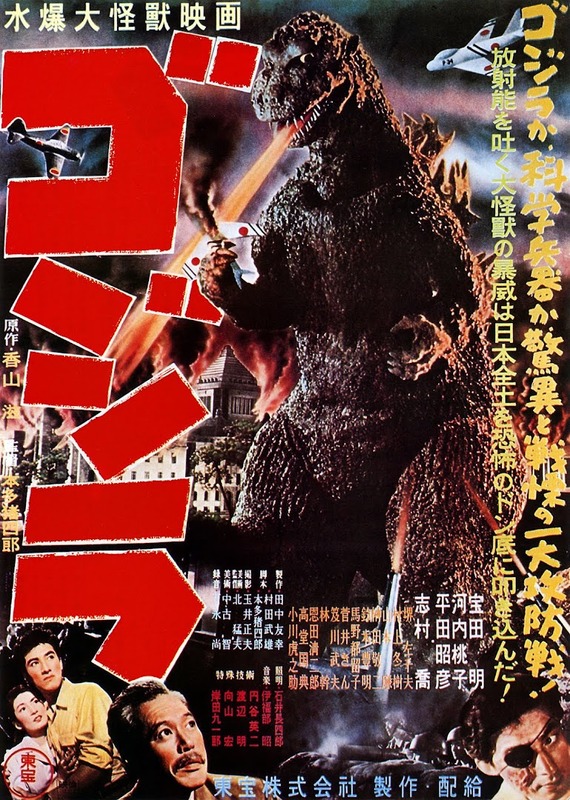 This Universal B-movie functions as just a humdrum filler and wastes the talents of all concerned. 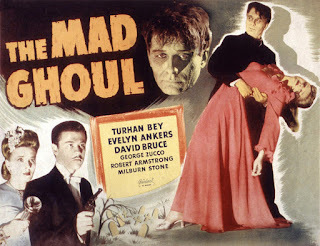 Under director James P. Hogan who had helmed some of the Bulldog Drummond sequels, and a lacklustre script by Paul Gangelin and Brenda Weisberg, three notable actors from the studio’s horror franchises wade through a by-the-numbers variant on the organ-harvesting mad scientist. 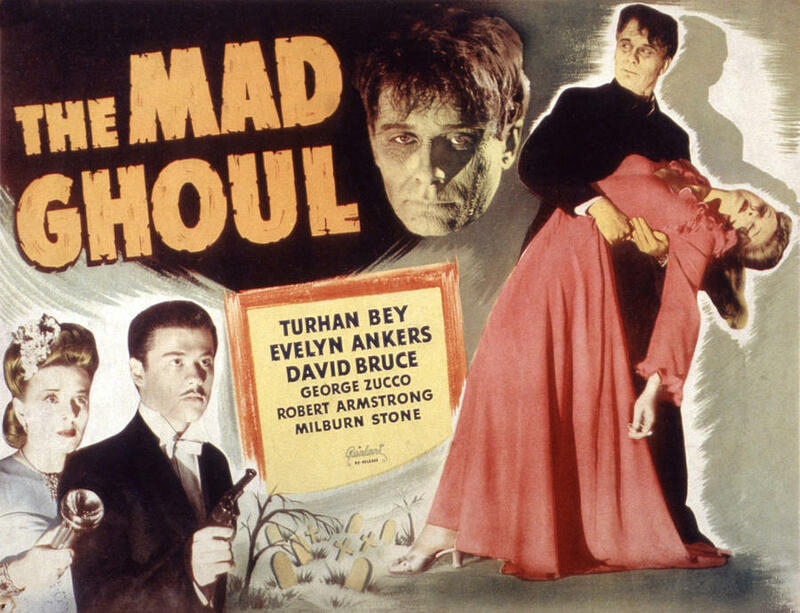 George Zucco and Turhan Bey had previously been on the same side as the sinister High Priest and apprentice in 1942’s The Mummy’s Tomb (see my review of 10/3/2017) while Evelyn Ankers had been agreeably adorning Universal horror films since Hold that Ghost (1941). 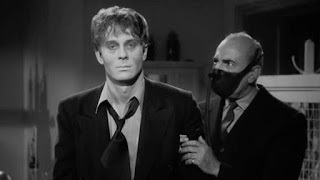 Here, Zucco applies his brand of academic evil with a nod to the Mummy films as Dr Alfred Morris, a university chemistry professor who has discovered a toxic nerve gas created by ancient Mayans (rather than Egyptians this time). The gas has properties of “diabolical power” which were harnessed to induce “life in death” in victims so that their hearts could be extracted as a gift to the gods. Morris recruits Ted Allison (David Bruce) to help him after a lecture. Ted is much more promising as a medical student than an actor, as we discover after Morris treats him to a dose of the gas formula he’s been developing in secret. One whiff of the noxious agent and Ted is rendered into cadaverous sleepwalking enslavement. This behaviour becomes turbo-charged into hacky melodramatics in his love-life sub-plot with Ankers as his fiancé Isabel Lewis, a singer of gratingly twee operetta ballads. Sappy Ted doesn’t know that Isabel no longer loves him. Moreover, he is also unware that Morris has designs on her and co-opts Ted’s state to program him into doing Morris’s bidding. This involves some nocturnal grave-robbing as the only way to keep Ted alive is with a regular supply of fresh hearts. While tormented Ted alternates between shuffling somnambulence and wakeful confusion, Morris makes a subtle move on Isabel, positioning himself he thinks as a suitor of greater experience for her. His inflated egotism makes no allowance for the fact that the vacuum in Isabel’s feelings has already been filled by her pianist Eric Iversen. In the role, Turhan Bey is required to do nothing more than literally accompany Ankers as a young debonair suitor. When Morris realises he has been eclipsed by the ivory-tinkling Egyptian, he adds Eric’s murder into Ted’s brainwashing. Meanwhile, the local newshounds begin barking as a connection becomes clear between the desecrations of recently-buried bodies and their taking place in the same towns as isabel’s excruciating recitals. Robert Armstrong, whom we last saw as showman Carl Denham in King Kong (1933), plays wiseguy reporter McClure with the same much-needed energy in his scenes. Sadly we don’t get the benefit of him for long - in his intrepid pursuit of a scoop, he persuades the funeral director in the town of Cranston to let him pose as a body but is throttled by Morris when he and Ted turn up. Rose Hobart as McClure’s hard-nosed colleague Della delivers a less than sensitive tribute to him in the aftermath: “He played a hunch there and lost”. In a rare compos mentis moment, Ted shows his chivalrous side to Isabel, freeing her of any guilt or obligation toward his feelings, which is more concern than she deserves. (The writers thought it credible that after Morris had zombified Ted, Isabel would buy his excuse that Ted had ‘collapsed’ at work and not bother to come and see him!). The poor schmuck still has to contend though with sudden lucid bursts of existential fear: “What am I? Alive or dead? Man or beast?” he wails at Machiavellian Morris. The climax treats us to a third wince-inducing rendition by Isabel at the Opera House, during which weaponised Ted appears on stage with a gun. Instead of understandably shooting her, he attempts to assassinate innocent Eric, but is plugged by cops waiting in the audience. It only remains for Morris to gain his comeuppance. Gassed by Ted, he scrabbles in the earth of the local cemetery, too late to perform a self-serving cardiectomy on his own. A repeat of earlier words from his hypnotised henchman resonates: “"It's all over, Doctor. There's nothing left of it now but you, and me, and... death". Audiences would no doubt allow their memories to spade earth over this dull potboiler.